I started writing this blog post this morning, Will woke up at an eye-watering 5am so I had some time before breakfast! Anyway, I then found another million things to do so thought I would leave writing until later in the day. One of today’s tasks was the weekly shop. I’ve done a lot of online food shopping since having Will but I must admit I don’t like it. I like the convenience, but I absolutely hate having no control of which food is chosen for me. I’m normally the person who picks up every single watermelon in the shop before deciding that the very first one I looked at was in fact, just fine! Shopping with Will has become a bit of a breeze recently though as he is happy to sit in the trolly, eating and nosing his way around the shop! I tend to take him a piece of fruit to eat en-route. Once home, with Will napping I decided to sit down to write a little more. I made myself a cup of tea, sat down at my desk and went to tuck my chair in. In doing so I happened to notice my feet, and it was at this precise moment that I realised I had gone all around town and to the supermarket in ODD SHOES! They didn’t even nearly resemble a pair! I think its fair to say that early mornings coupled with moving house and finishing maternity leave is starting to take its toll… on my wardrobe choices if nothing else! Thankfully I’m not making such mistakes in the kitchen! I’ve been frantically filling my freezer with food so that when we begin moving house lunches and supper will be taken care of. Snacks and meals that can be eaten hot or cold, at any time of day are going to be a necessity over the next few weeks, especially as the house we are moving into is still derelict, and I go back to work next week! This recipe is something I make quite often, we have them as snacks, with big bowls of soup or as an alternative to bread. 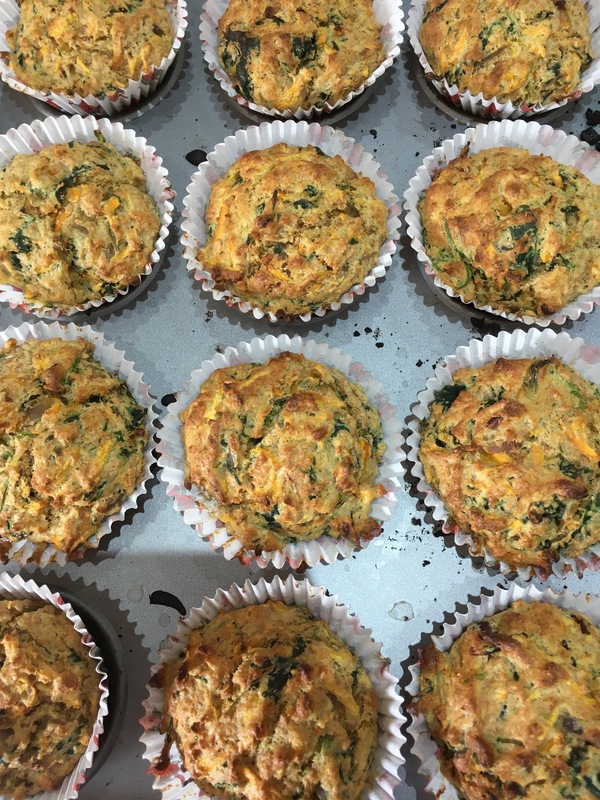 Savoury muffins are something I never really enjoyed; I found most recipes came out heavy, ‘healthy tasting’ (code for dull) and with a chewy, often unpleasant texture. I then came across a recipe that used buttermilk and I decided to experiment. The following is the result of a few months experimenting with different flavours. These are delicious, delicately spiced with cumin and coriander, but not overpoweringly so. The recipe looks like it contains lots of raising agents, and to be fair it does, but the resulting muffin is light, fluffy and not at all greasy like shop-bought sweet muffins can be. The key with this recipe, as with soda bread, is to act quickly once you have added the buttermilk into the batter. The buttermilk is added last and the muffins will be lightest and most fluffy if they get into the oven as quickly as possible, no pressure! I’ve probably made the recipe sound scary now, but they are incredibly easy to make. The vegetables can be swapped for alternatives such as butternut squash, Kale, courgette or sweet potato, or anything else you fancy/have to hand. It goes without saying that these are an excellent way of sneaking vegetables into fussy children. More than this though, they are actually a brilliant way of celebrating just how delicious vegetables can be! Savoury muffins are also a great food to give when weaning as the texture is softer and more moist than bread. Will has them along side soup to dunk, or just with some cheese for a simple, quick lunch. Peel and dice an onion, add this to the frying pan and soften in the butter. Finally pour in the buttermilk, combine quickly and spoon into muffin cases as efficiently as you can. The mixture will start to foam and become light and airy as soon as the buttermilk and bicarb react. Bake for 17-20 minutes, until golden and hollow sounding when the bases are tapped. These keep for 5 days in a sealed container but they freeze well too. I have a freezer full of them now for Will’s packed lunch, and my own! I use buckwheat flour to bake savoury muffins with buttermilk. 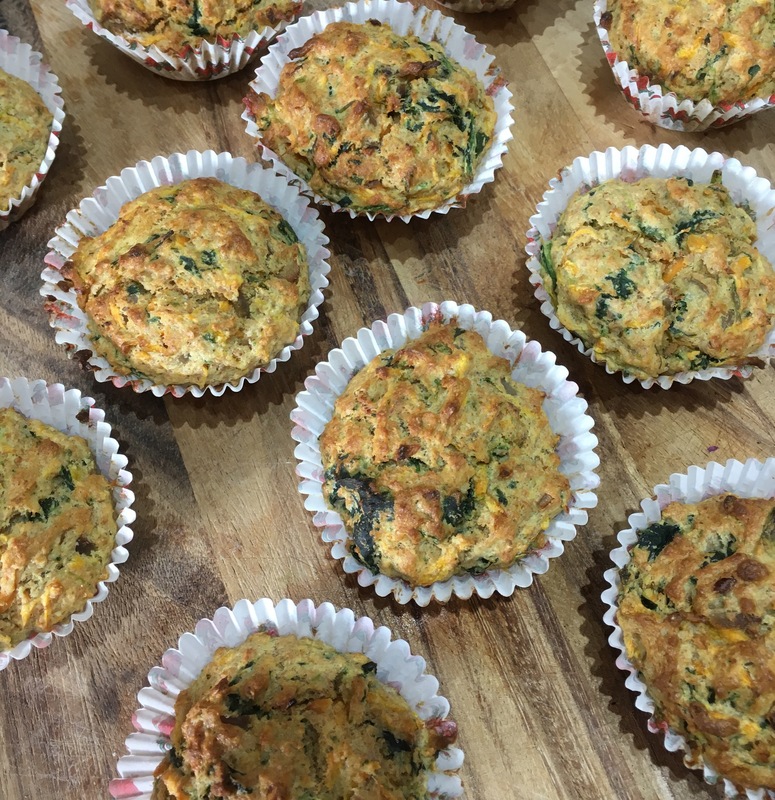 I like to include extra protein into these muffins – cooked chicken pieces, cottage cheese, even wild caught canned salmon. They are quite filling. 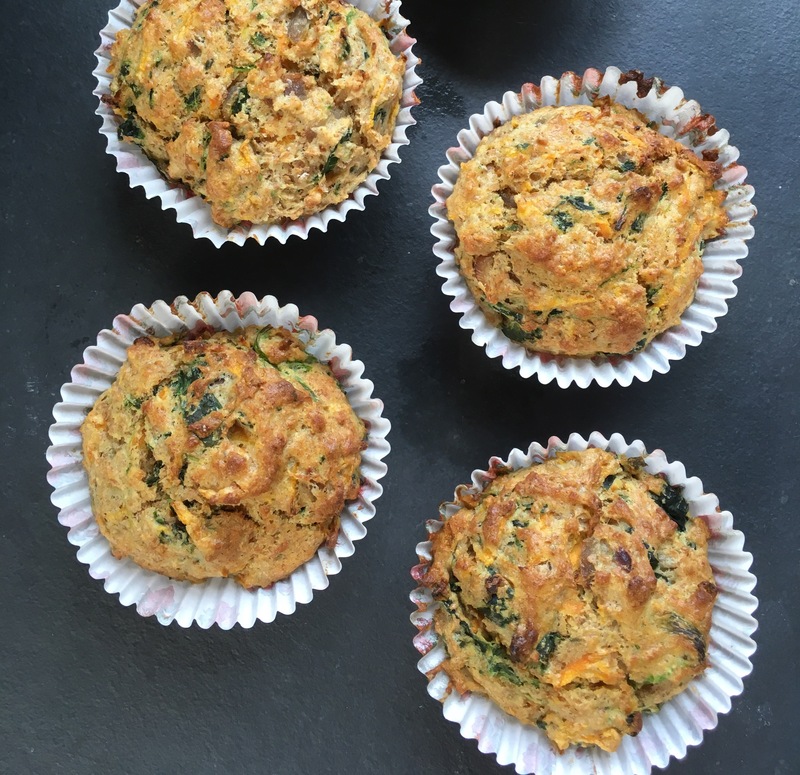 I’ve never tried using buckwheat flour in savoury muffins but I’m keen to try it as I love using buckwheat! Great ideas adding extra protein too! Thank you for stopping at my blog. I will try this recipe since i love baking and cooking! I really need to buy an oven, that looks yummy! Thank you! They are lovely even if I say so myself!